Will Exercise Improve My O2 Saturation? 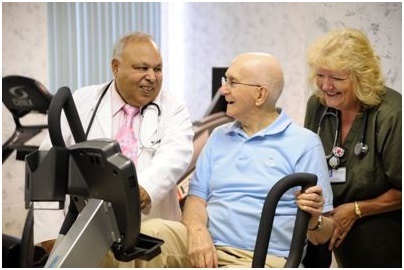 I know it is important to have a regular exercise program to improve breathing, and that pulmonary rehabilitation is a great way of exercising. Will my exercising also improve my oxygen saturation for daily activities I do without using O2, and will it keep my oxygen saturations higher while doing the 6 minute walk at my doctors? It is known that muscles that are in better condition do a better job of utilizing oxygen. When you’re in better shape, you can do more, even if your lung condition itself does not change. However, if a person with COPD increases their fitness level through exercise, it cannot be assumed that they will require less oxygen, or no longer need their supplemental oxygen. Again, your lungs are damaged and that cannot be reversed. I’m not sure what you mean about the 6-minute walk keeping levels high. I will say that if a person with COPD does correct pursed-lips and diaphragmatic breathing, he or she can increase their O2 saturation numbers by a couple points with activity and walking. This doesn’t mean, though, that they can get rid of their supplemental oxygen. The best way to check for oxygen needs is to use a pulse oximeter in a variety of situations: sitting, walking, doing chores, etc. and record your numbers. Then have a talk with your pulmonary health care professional about what’s safe and right for you. There's been some significant discussion regarding strength training to tone muscles and to help build some muscle mass (not body building, just regaining some muscle mass lost with age and inactivity). There are a couple of programs that have concentrated more on working with weights and resistance than on aerobics and that regimen does seem to have the effect of improving O2 saturation levels, meaning that people need to use less O2 than they did before. We know that well-toned muscles can do a lot more with less O2 than weak, flabby ones, so this makes perfectly good sense. I am encouraging the people I know to try to test this theory in some PR programs. Following pulmonary rehab last year, I've been regularly exercising (aerobics and weights) around 5 times a week. Of course some days are better than others. My goal is to walk a minimum of 10,000 steps a day. Yesterday I walked over 13,000 steps, the day before only 6,800. I KNOW I am much stronger physically today than I was a year ago. And I'm confident it's due to the fact that I'm exercising. I'm afraid that some people when starting a exercise program may get discouraged and not continue. I think sometimes we want to see "instant results" and when we can't walk for 6 minutes without stopping and can't lift that 10 lb weight (hint: start with a 2 or 3 lb weight) we give up. And that's a real shame. And if I remember correctly, doesn't slow and steady win the race? I have mentioned this here in the past but thought I would comment again. My O2 saturation has improved since I have been doing more strength training. That is not to say my lung function has improved, I don't want to mislead anyone. Rather, it is largely a result of improved muscle tone as Jean explained. That is fine by me, I'll take it. I do a fairly intense strengthening routine (all things considered) and it has really worked for me. Strong healthy muscle has improved my quality of life. Of course, always talk to your doctors first, all of them including your cardiologist. My routine came from an pulmonary exercise program where I worked with a physiologist and a respiratory therapists all under the supervision of my pulmonologist. Do it but do it safely. Next week I start an 18 week, (Tue & Thur 1 hour class), of pulmonary rehabilitation. I have been told each person that has COPD may have a different experience. I believe that is true - folks are different. I'm 73 and been retired for 11 years. Oxygen has been my pal for 4 years and I use 3 LPM with a home unit and portable unit. The portable unit does not stop me from having shortness of breath even after a short walk of 50 feet. I have been told that the rehab pgm may add some strength to my body so I might once again feel like living and not just 'being alive'. In the weeks to come I will comment on my experience at rehab and keep my confidence that the exercises will help manage the disease. PS. I noticed the map showing % of COPD patients in the USA and viewed the area with the greatest % of patients. It seems the southeastern states gets the blue ribbon - do you think that area has a direct relationship to the tobacco industry? I anxiously awaited getting into a pulmo rehab program. After testing, my pulmo's tech gave me a scrip to proceed with it. I was not pleased with the staff. Consequently stopped going after a couple months. I'm somewhat active, just not nearly enough, and fortunately do not require O2 yet. My big priority this month is to QUIT SMOKING!